How to use this module Partners in Global Health Education 1. 2. 3. 4. 5. 6. 7. 8. 9. 10. 11. 12. 13. 14. 15. 16. 17. 18. How to use this module Learning outcomes Plasmodium species Malaria burden Question 1 Transmission Life cycle Question 2 Disease severity Question 3 Clinical malaria Question 4 Diagnosis Treatment Prevention and control Pregnancy Question 5 Information sources • • • 2 of 54 This self-directed learning (SDL) module has been designed for medical and other health care students We suggest that start with the learning objectives and try to keep these in mind as you go through the module slide by slide, in order and at your own pace. 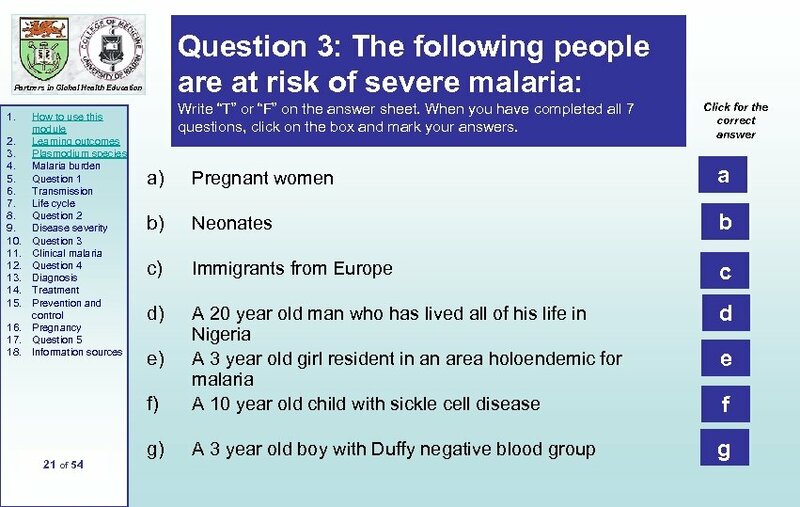 Print-out the malaria SDL answer sheet. Write your answers to the questions on the mark sheet as best you can before looking at the answers. Repeat the module until you have achieved a mark of > 22/27 (>80%). You should research any issues that you are unsure about. Look in your textbooks, access the on-line resources indicated at the end of the module and discuss with your peers and teachers. Finally, enjoy your learning! 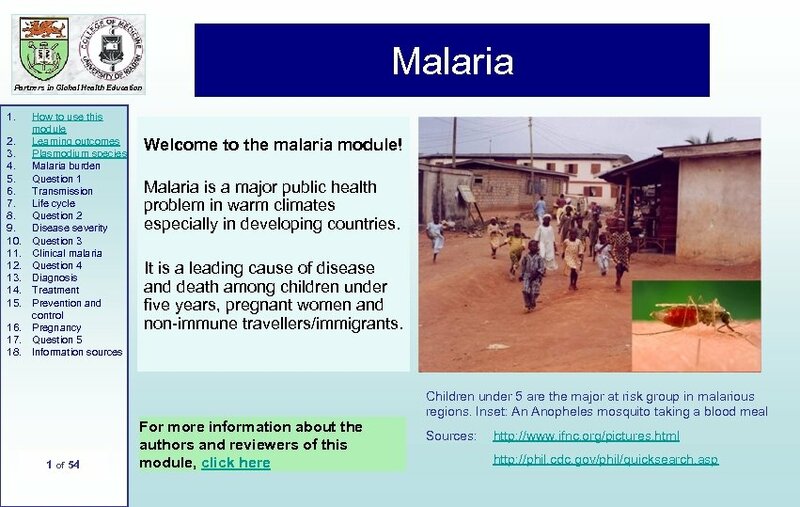 We hope that this module will be enjoyable to study and complement your learning about malaria from other sources. 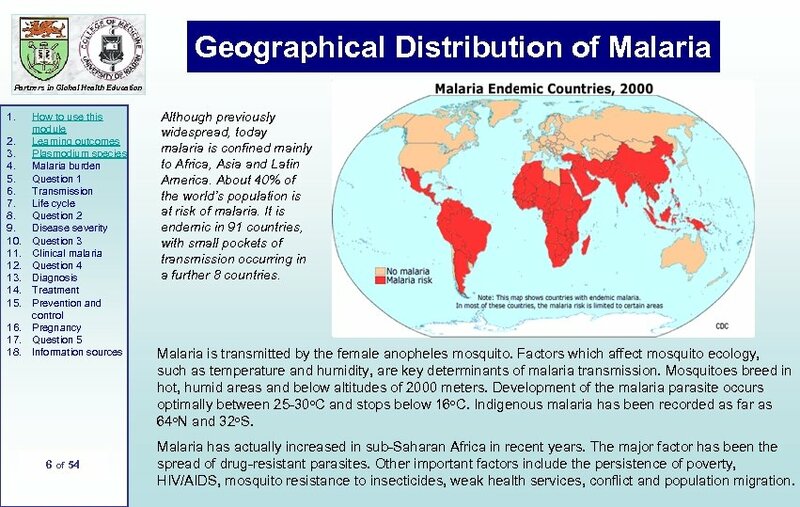 Geographical Distribution of Malaria Partners in Global Health Education 1. 2. 3. 4. 5. 6. 7. 8. 9. 10. 11. 12. 13. 14. 15. 16. 17. 18. How to use this module Learning outcomes Plasmodium species Malaria burden Question 1 Transmission Life cycle Question 2 Disease severity Question 3 Clinical malaria Question 4 Diagnosis Treatment Prevention and control Pregnancy Question 5 Information sources 6 of 54 Although previously widespread, today malaria is confined mainly to Africa, Asia and Latin America. About 40% of the world’s population is at risk of malaria. It is endemic in 91 countries, with small pockets of transmission occurring in a further 8 countries. 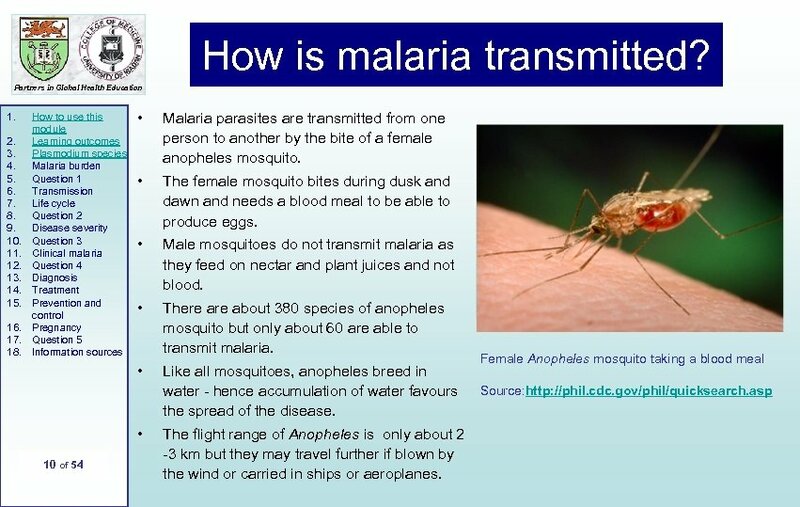 Malaria is transmitted by the female anopheles mosquito. Factors which affect mosquito ecology, such as temperature and humidity, are key determinants of malaria transmission. Mosquitoes breed in hot, humid areas and below altitudes of 2000 meters. 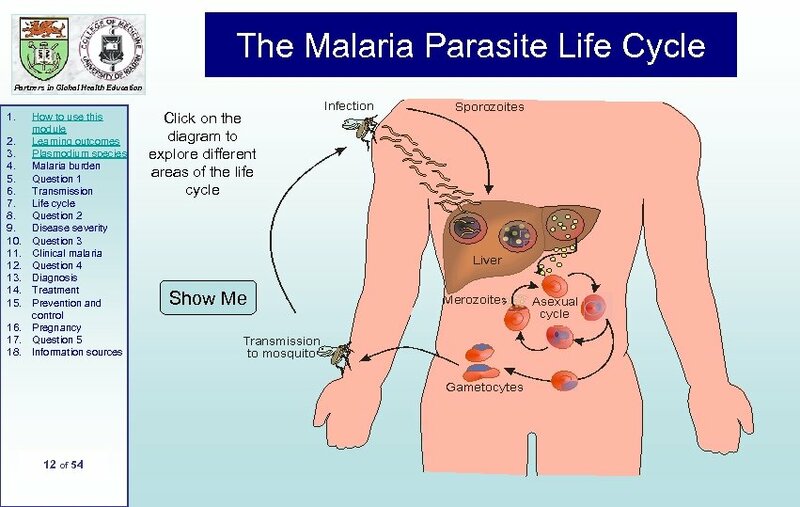 Development of the malaria parasite occurs optimally between 25 -30 o. C and stops below 16 o. C. Indigenous malaria has been recorded as far as 64 o. N and 32 o. S. Malaria has actually increased in sub-Saharan Africa in recent years. The major factor has been the spread of drug-resistant parasites. Other important factors include the persistence of poverty, HIV/AIDS, mosquito resistance to insecticides, weak health services, conflict and population migration. 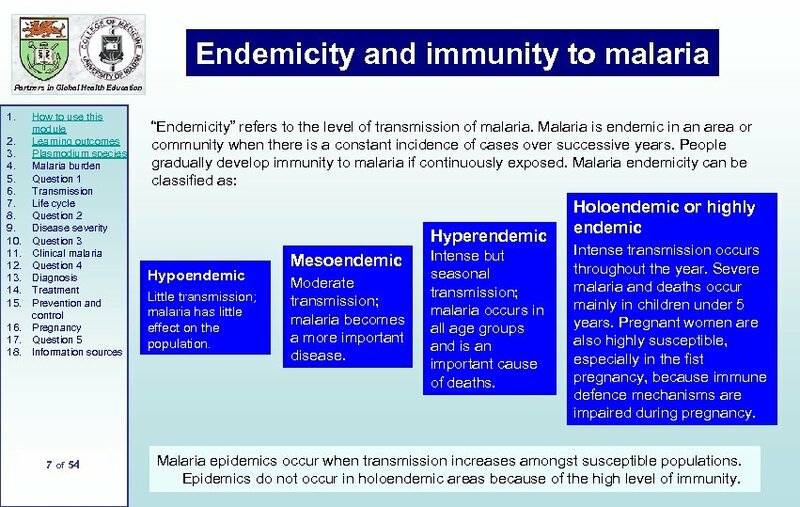 Endemicity and immunity to malaria Partners in Global Health Education 1. 2. 3. 4. 5. 6. 7. 8. 9. 10. 11. 12. 13. 14. 15. 16. 17. 18. How to use this module Learning outcomes Plasmodium species Malaria burden Question 1 Transmission Life cycle Question 2 Disease severity Question 3 Clinical malaria Question 4 Diagnosis Treatment Prevention and control Pregnancy Question 5 Information sources 7 of 54 “Endemicity” refers to the level of transmission of malaria. Malaria is endemic in an area or community when there is a constant incidence of cases over successive years. People gradually develop immunity to malaria if continuously exposed. 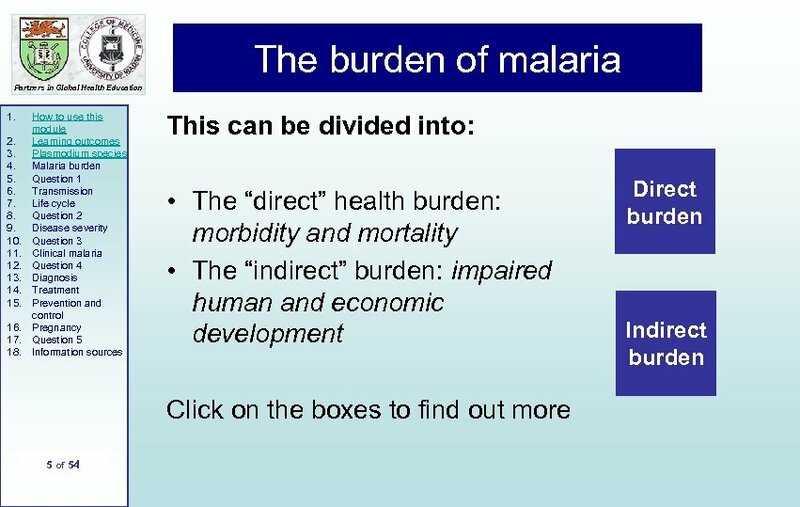 Malaria endemicity can be classified as: Hyperendemic Hypoendemic Little transmission; malaria has little effect on the population. Mesoendemic Moderate transmission; malaria becomes a more important disease. Intense but seasonal transmission; malaria occurs in all age groups and is an important cause of deaths. Holoendemic or highly endemic Intense transmission occurs throughout the year. 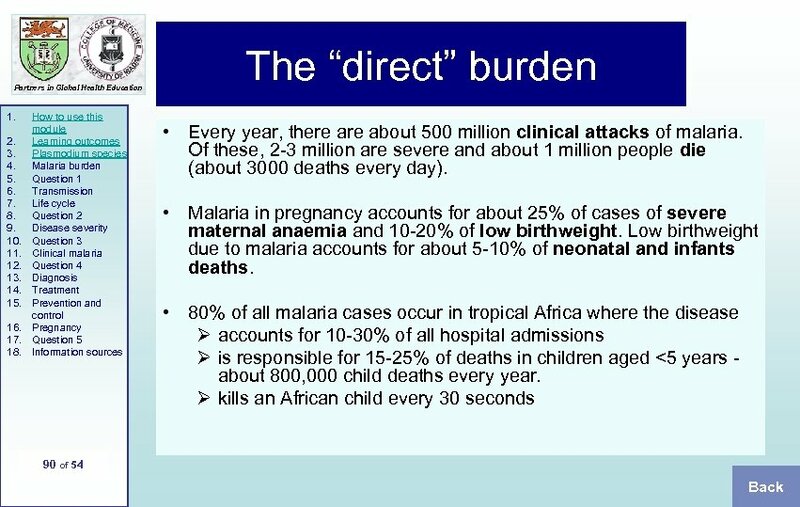 Severe malaria and deaths occur mainly in children under 5 years. Pregnant women are also highly susceptible, especially in the fist pregnancy, because immune defence mechanisms are impaired during pregnancy. Malaria epidemics occur when transmission increases amongst susceptible populations. Epidemics do not occur in holoendemic areas because of the high level of immunity. End of Section 1 Partners in Global Health Education 1. 2. 3. 4. 5. 6. 7. 8. 9. 10. 11. 12. 13. 14. 15. 16. 17. 18. How to use this module Learning outcomes Plasmodium species Malaria burden Question 1 Transmission Life cycle Question 2 Disease severity Question 3 Clinical malaria Question 4 Diagnosis Treatment Prevention and control Pregnancy Question 5 Information sources 8 of 54 Well done! 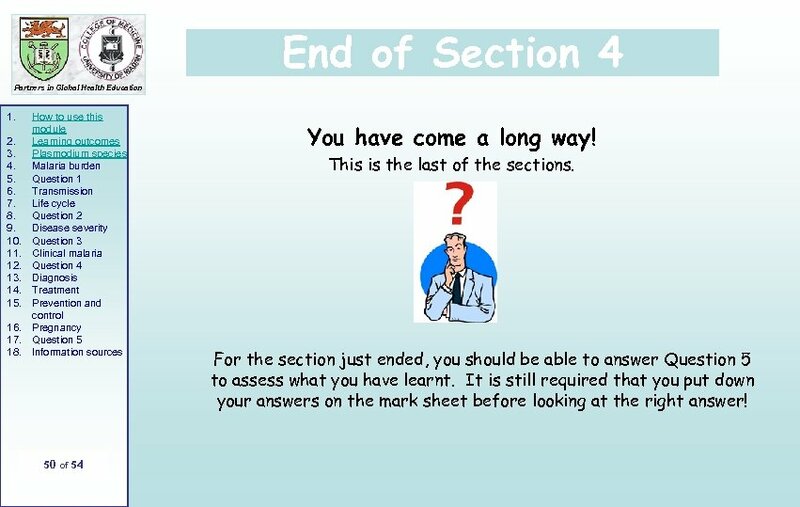 You have come to the end of the first section. We suggest that you answer Question 1 to assess your learning so far. Please remember to write your answers on the mark sheet before looking at the correct answers! Severity of disease and host factors Partners in Global Health Education 1. 2. 3. 4. 5. 6. 7. 8. 9. 10. 11. 12. 13. 14. 15. 16. 17. 18. How to use this module Learning outcomes Plasmodium species Malaria burden Question 1 Transmission Life cycle Question 2 Disease severity Question 3 Clinical malaria Question 4 Diagnosis Treatment Prevention and control Pregnancy Question 5 Information sources In addition to parasite factors, several host factors determine the outcome of exposure to malaria: Naturally-acquired immunity. People who are constantly exposed to malaria gradually acquire immunity, firstly against clinical disease and later against parasite infection. 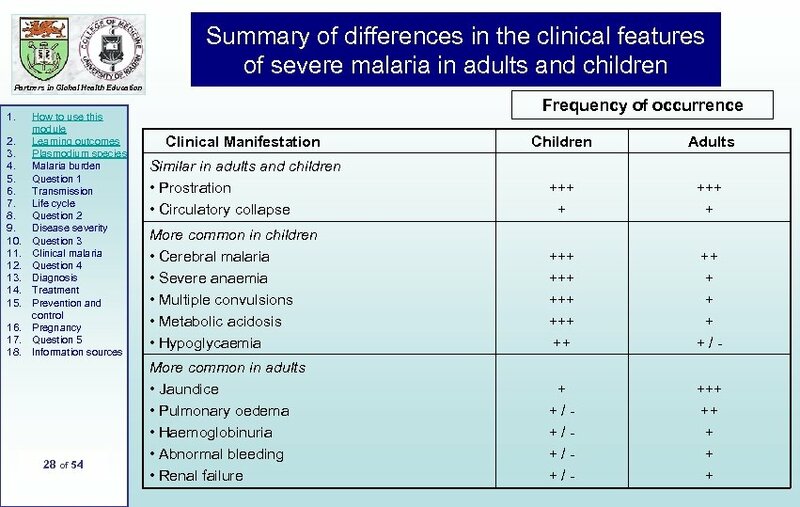 Clinical manifestations of malaria are most severe in the non-immune. In holoendemic areas, these are children aged <5 years and pregnant women (especially primagravidae). People of any age from areas that are free from malaria, or have limited malaria transmission, are at risk when they are exposed to malaria. • Red cell and haemoglobin variants. 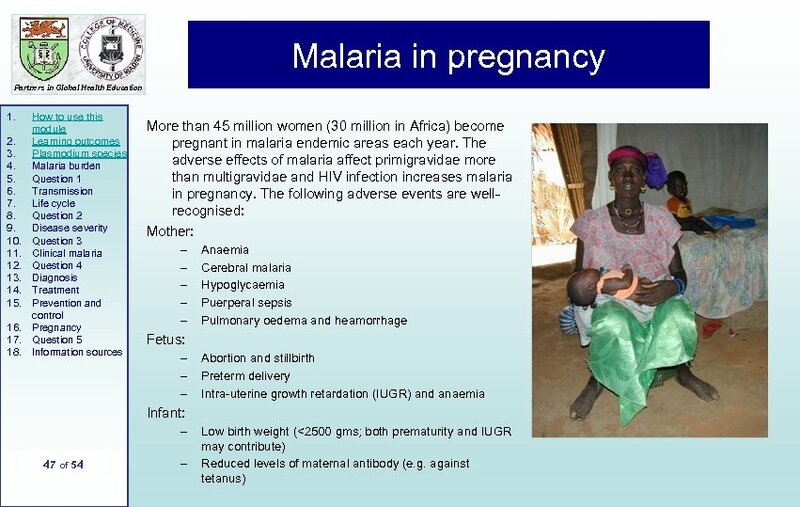 Well known examples of inherited factors that protect against malaria are Haemoglobin S carrier state, the thalassaemias and Glucose-6 -phosphate dehydrogenase (G 6 PD) deficiency. Malaria provides the best known example whereby an environmental factor (malaria) has selected human genes because of their survival advantage. • Foetal haemoglobin (Hb. F): High levels of Hb. F occur in neonates, and in some people with inherited haemoglobin variants, protect against severe forms of P. falciparum malaria. • 18 of 54 • Duffy blood group: P. vivax requires the Duffy blood receptor to enter red blood cells. Therefore, people who do not carry the Duffy blood group are resistant to this malaria species. 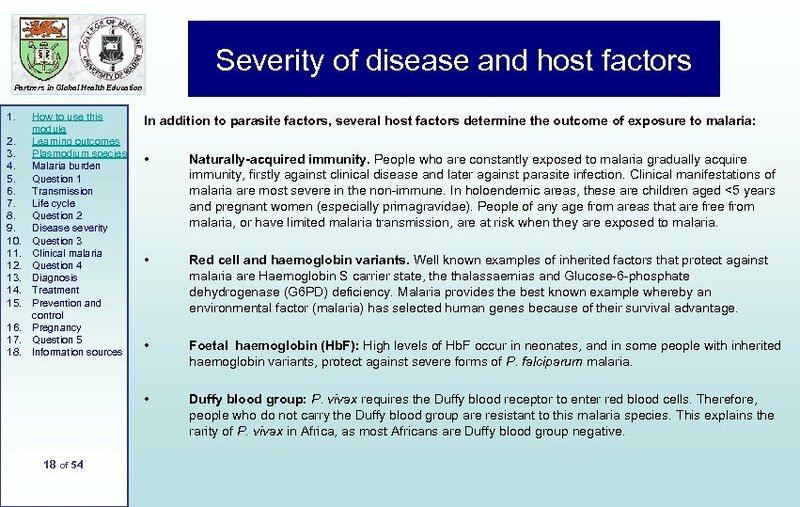 This explains the rarity of P. vivax in Africa, as most Africans are Duffy blood group negative. End of Section 2 Partners in Global Health Education 1. 2. 3. 4. 5. 6. 7. 8. 9. 10. 11. 12. 13. 14. 15. 16. 17. 18. 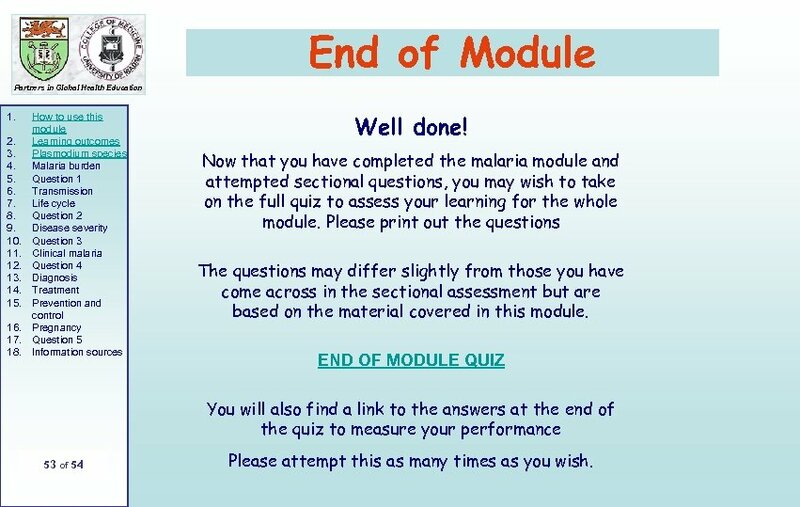 How to use this module Learning outcomes Plasmodium species Malaria burden Question 1 Transmission Life cycle Question 2 Disease severity Question 3 Clinical malaria Question 4 Diagnosis Treatment Prevention and control Pregnancy Question 5 Information sources 19 of 54 Well done! This is the end of the second section. 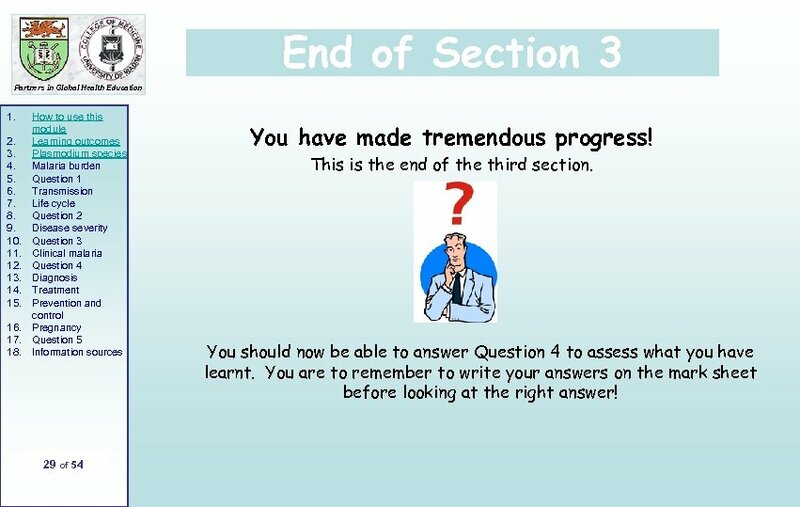 We suggest that you proceed to answer questions 2 and 3 to assess your learning further. Do remember to write your answers on the mark sheet before looking at the right answer! Question 2: Parasite factors and disease severity. Partners in Global Health Education 1. 2. 3. 4. 5. 6. 7. 8. 9. 10. 11. 12. 13. 14. 15. 16. 17. 18. 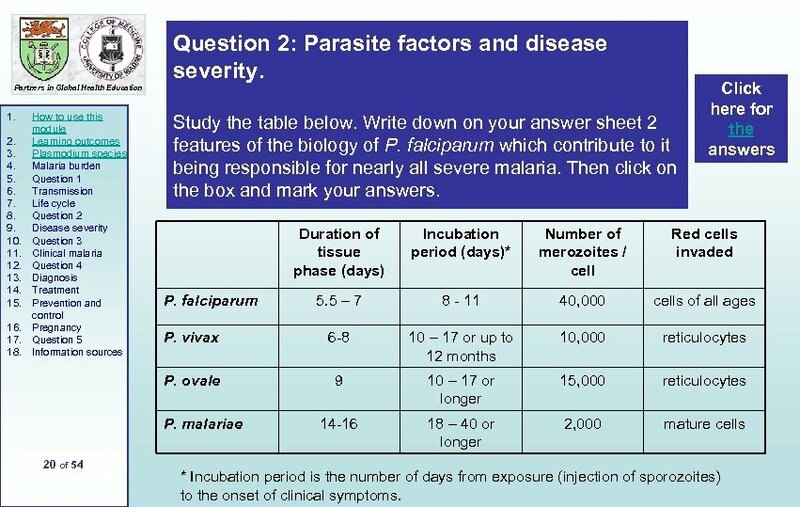 How to use this module Learning outcomes Plasmodium species Malaria burden Question 1 Transmission Life cycle Question 2 Disease severity Question 3 Clinical malaria Question 4 Diagnosis Treatment Prevention and control Pregnancy Question 5 Information sources Study the table below. 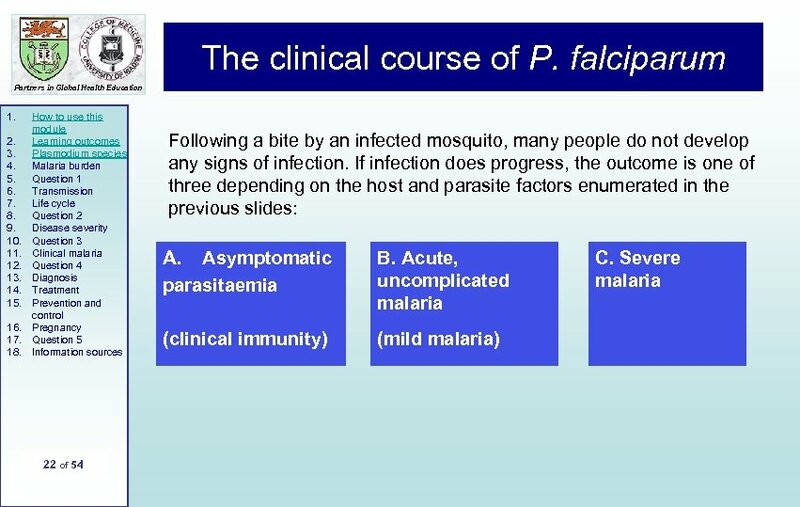 Write down on your answer sheet 2 features of the biology of P. falciparum which contribute to it being responsible for nearly all severe malaria. Then click on the box and mark your answers. Click here for the answers Duration of tissue phase (days) Incubation period (days)* Number of merozoites / cell Red cells invaded 5. 5 – 7 8 - 11 40, 000 cells of all ages P. vivax 6 -8 10 – 17 or up to 12 months 10, 000 reticulocytes P. ovale 9 10 – 17 or longer 15, 000 reticulocytes 14 -16 18 – 40 or longer 2, 000 mature cells P. falciparum P. malariae 20 of 54 * Incubation period is the number of days from exposure (injection of sporozoites) to the onset of clinical symptoms. A. Asymptomatic parasitaemia Partners in Global Health Education 1. 2. 3. 4. 5. 6. 7. 8. 9. 10. 11. 12. 13. 14. 15. 16. 17. 18. How to use this module Learning outcomes Plasmodium species Malaria burden Question 1 Transmission Life cycle Question 2 Disease severity Question 3 Clinical malaria Question 4 Diagnosis Treatment Prevention and control Pregnancy Question 5 Information sources 23 of 54 This is usually seen in older children and adults who have acquired “clinical immunity” to disease as a consequence of living in areas with high malaria endemicity. There are malaria parasites in the peripheral blood but no symptoms. These individuals may be important reservoirs for disease transmission. 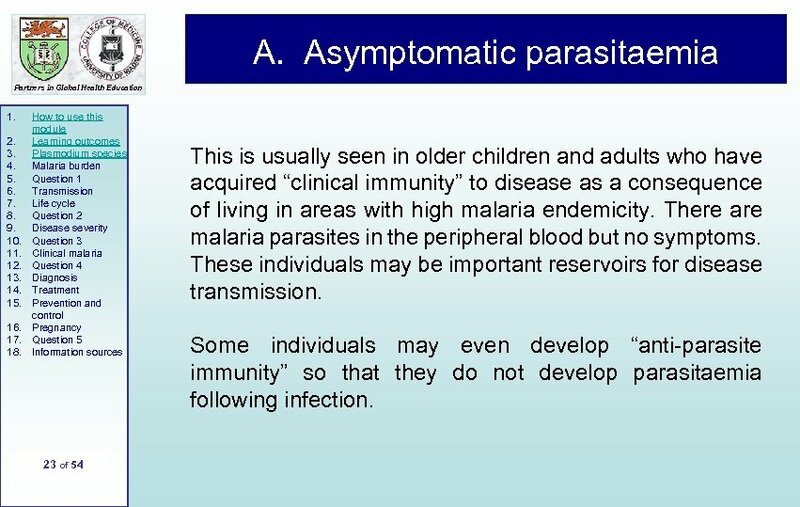 Some individuals may even develop “anti-parasite immunity” so that they do not develop parasitaemia following infection. B. 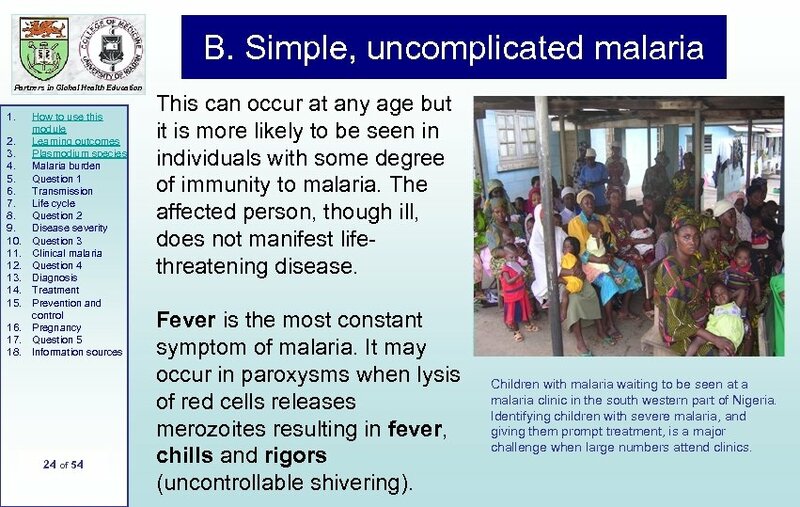 Simple, uncomplicated malaria Partners in Global Health Education 1. 2. 3. 4. 5. 6. 7. 8. 9. 10. 11. 12. 13. 14. 15. 16. 17. 18. How to use this module Learning outcomes Plasmodium species Malaria burden Question 1 Transmission Life cycle Question 2 Disease severity Question 3 Clinical malaria Question 4 Diagnosis Treatment Prevention and control Pregnancy Question 5 Information sources 24 of 54 This can occur at any age but it is more likely to be seen in individuals with some degree of immunity to malaria. The affected person, though ill, does not manifest lifethreatening disease. Fever is the most constant symptom of malaria. It may occur in paroxysms when lysis of red cells releases merozoites resulting in fever, chills and rigors (uncontrollable shivering). Children with malaria waiting to be seen at a malaria clinic in the south western part of Nigeria. Identifying children with severe malaria, and giving them prompt treatment, is a major challenge when large numbers attend clinics. 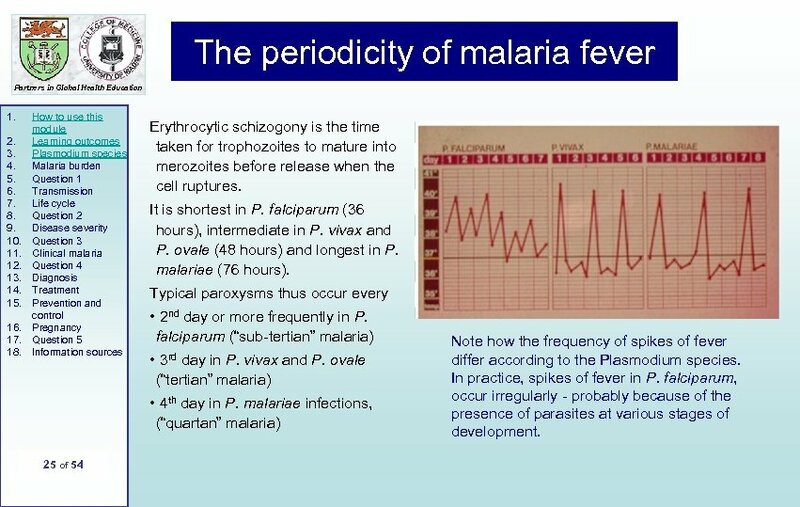 The periodicity of malaria fever Partners in Global Health Education 1. 2. 3. 4. 5. 6. 7. 8. 9. 10. 11. 12. 13. 14. 15. 16. 17. 18. How to use this module Learning outcomes Plasmodium species Malaria burden Question 1 Transmission Life cycle Question 2 Disease severity Question 3 Clinical malaria Question 4 Diagnosis Treatment Prevention and control Pregnancy Question 5 Information sources Erythrocytic schizogony is the time taken for trophozoites to mature into merozoites before release when the cell ruptures. It is shortest in P. falciparum (36 hours), intermediate in P. vivax and P. ovale (48 hours) and longest in P. malariae (76 hours). 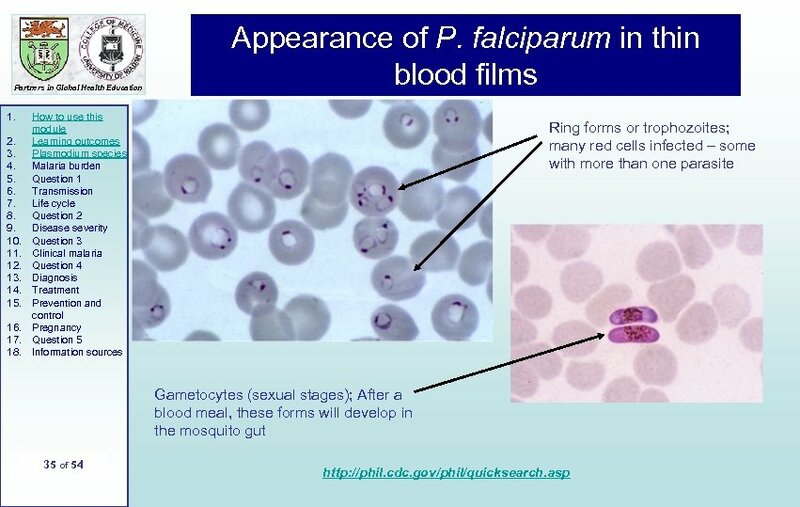 Typical paroxysms thus occur every • 2 nd day or more frequently in P. falciparum (“sub-tertian” malaria) • 3 rd day in P. vivax and P. ovale (“tertian” malaria) • 4 th day in P. malariae infections, (“quartan” malaria) 25 of 54 Note how the frequency of spikes of fever differ according to the Plasmodium species. 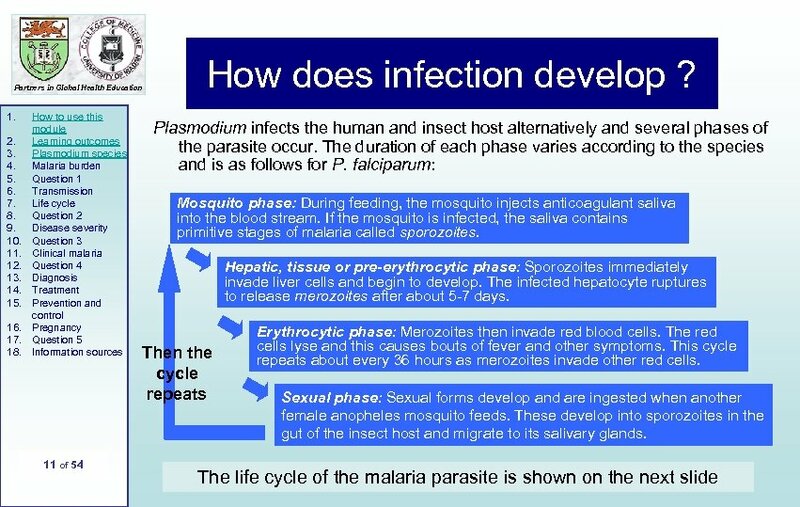 In practice, spikes of fever in P. falciparum, occur irregularly - probably because of the presence of parasites at various stages of development. 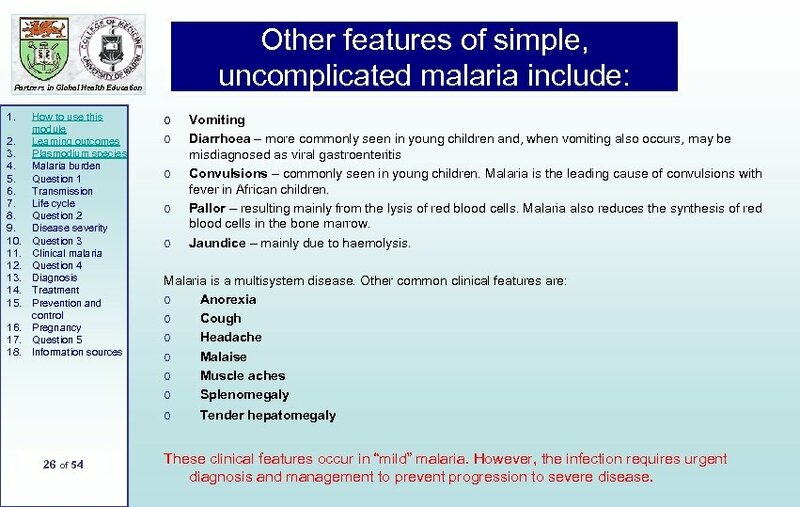 Other features of simple, uncomplicated malaria include: Partners in Global Health Education 1. 2. 3. 4. 5. 6. 7. 8. 9. 10. 11. 12. 13. 14. 15. 16. 17. 18. 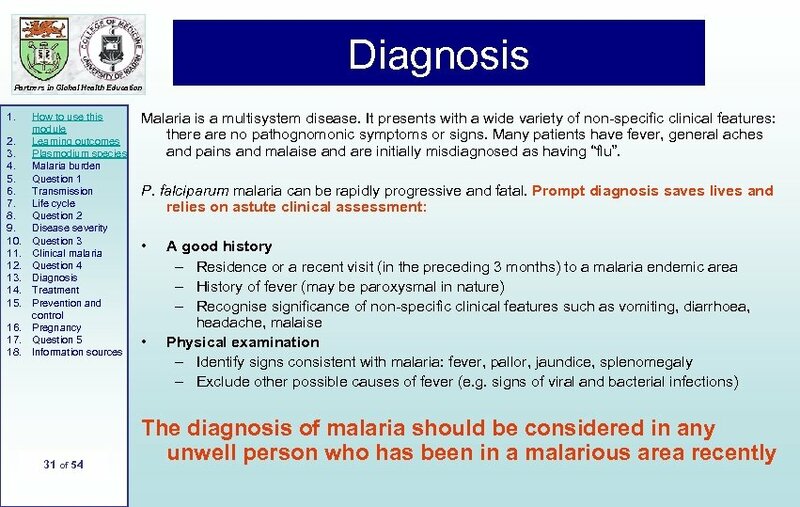 How to use this module Learning outcomes Plasmodium species Malaria burden Question 1 Transmission Life cycle Question 2 Disease severity Question 3 Clinical malaria Question 4 Diagnosis Treatment Prevention and control Pregnancy Question 5 Information sources o o o Malaria is a multisystem disease. Other common clinical features are: o Anorexia o Cough o Headache o Malaise o Muscle aches o Splenomegaly o 26 of 54 Vomiting Diarrhoea – more commonly seen in young children and, when vomiting also occurs, may be misdiagnosed as viral gastroenteritis Convulsions – commonly seen in young children. Malaria is the leading cause of convulsions with fever in African children. Pallor – resulting mainly from the lysis of red blood cells. Malaria also reduces the synthesis of red blood cells in the bone marrow. Jaundice – mainly due to haemolysis. Tender hepatomegaly These clinical features occur in “mild” malaria. However, the infection requires urgent diagnosis and management to prevent progression to severe disease. 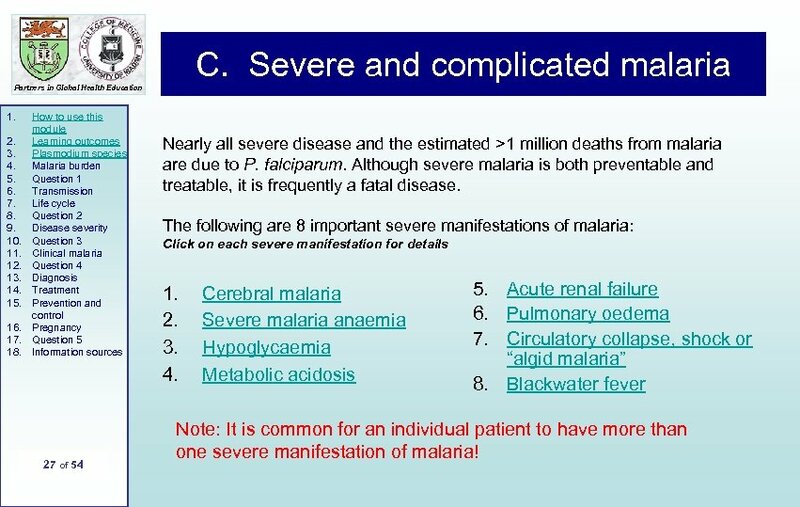 C. Severe and complicated malaria Partners in Global Health Education 1. 2. 3. 4. 5. 6. 7. 8. 9. 10. 11. 12. 13. 14. 15. 16. 17. 18. 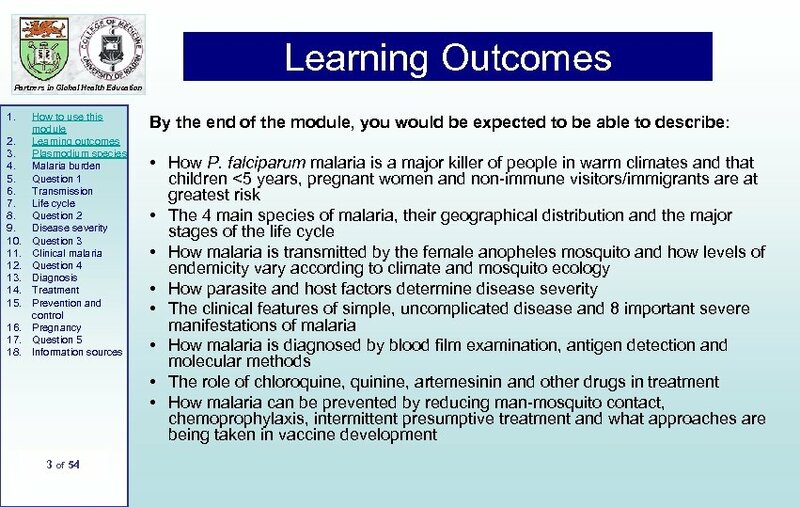 How to use this module Learning outcomes Plasmodium species Malaria burden Question 1 Transmission Life cycle Question 2 Disease severity Question 3 Clinical malaria Question 4 Diagnosis Treatment Prevention and control Pregnancy Question 5 Information sources 27 of 54 Nearly all severe disease and the estimated >1 million deaths from malaria are due to P. falciparum. Although severe malaria is both preventable and treatable, it is frequently a fatal disease. The following are 8 important severe manifestations of malaria: Click on each severe manifestation for details 1. 2. 3. 4. Cerebral malaria Severe malaria anaemia Hypoglycaemia Metabolic acidosis 5. Acute renal failure 6. Pulmonary oedema 7. Circulatory collapse, shock or “algid malaria” 8. 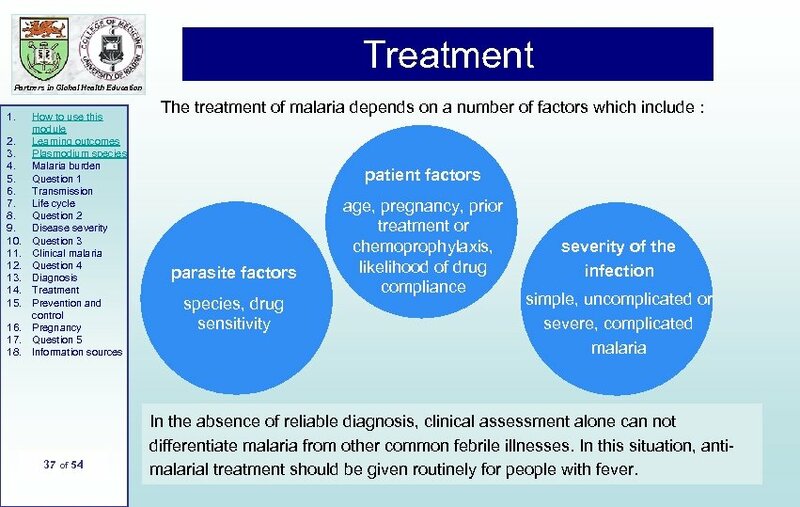 Blackwater fever Note: It is common for an individual patient to have more than one severe manifestation of malaria! End of Section 3 Partners in Global Health Education 1. 2. 3. 4. 5. 6. 7. 8. 9. 10. 11. 12. 13. 14. 15. 16. 17. 18. How to use this module Learning outcomes Plasmodium species Malaria burden Question 1 Transmission Life cycle Question 2 Disease severity Question 3 Clinical malaria Question 4 Diagnosis Treatment Prevention and control Pregnancy Question 5 Information sources 29 of 54 You have made tremendous progress! This is the end of the third section. You should now be able to answer Question 4 to assess what you have learnt. You are to remember to write your answers on the mark sheet before looking at the right answer! 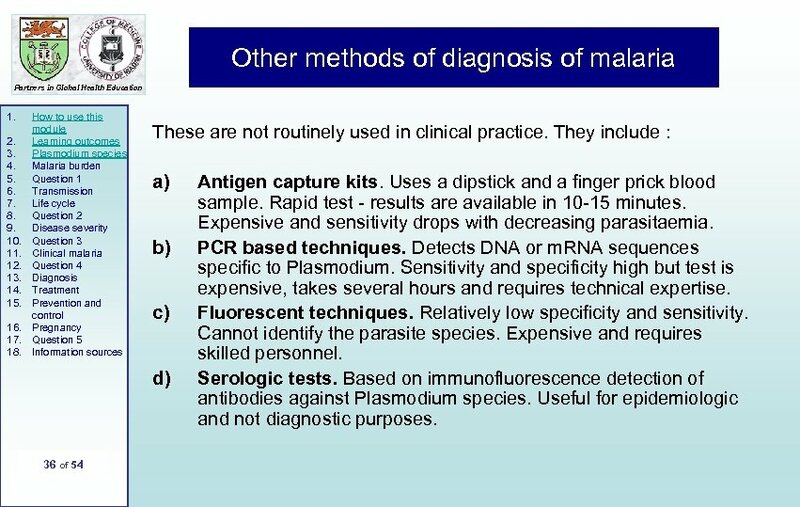 Other methods of diagnosis of malaria Partners in Global Health Education 1. 2. 3. 4. 5. 6. 7. 8. 9. 10. 11. 12. 13. 14. 15. 16. 17. 18. 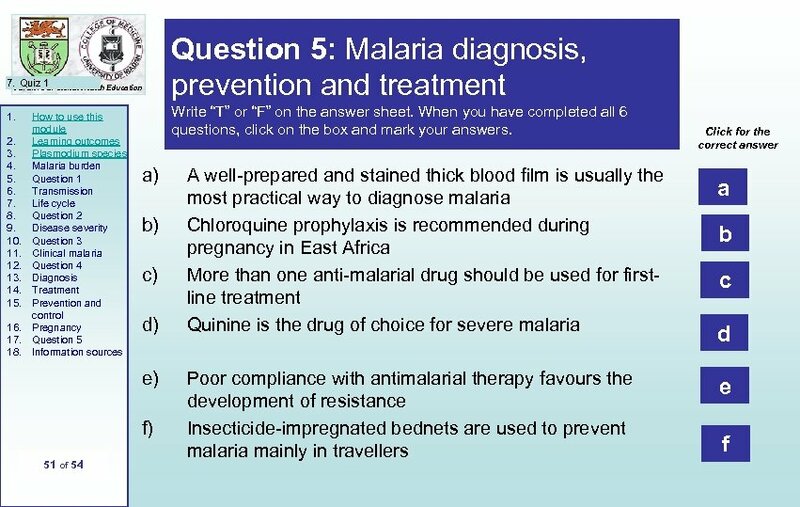 How to use this module Learning outcomes Plasmodium species Malaria burden Question 1 Transmission Life cycle Question 2 Disease severity Question 3 Clinical malaria Question 4 Diagnosis Treatment Prevention and control Pregnancy Question 5 Information sources These are not routinely used in clinical practice. They include : a) b) c) d) 36 of 54 Antigen capture kits. Uses a dipstick and a finger prick blood sample. Rapid test - results are available in 10 -15 minutes. Expensive and sensitivity drops with decreasing parasitaemia. PCR based techniques. Detects DNA or m. RNA sequences specific to Plasmodium. Sensitivity and specificity high but test is expensive, takes several hours and requires technical expertise. Fluorescent techniques. Relatively low specificity and sensitivity. Cannot identify the parasite species. Expensive and requires skilled personnel. Serologic tests. Based on immunofluorescence detection of antibodies against Plasmodium species. Useful for epidemiologic and not diagnostic purposes. Treatment Partners in Global Health Education 1. 2. 3. 4. 5. 6. 7. 8. 9. 10. 11. 12. 13. 14. 15. 16. 17. 18. How to use this module Learning outcomes Plasmodium species Malaria burden Question 1 Transmission Life cycle Question 2 Disease severity Question 3 Clinical malaria Question 4 Diagnosis Treatment Prevention and control Pregnancy Question 5 Information sources 37 of 54 The treatment of malaria depends on a number of factors which include : patient factors parasite factors species, drug sensitivity age, pregnancy, prior treatment or chemoprophylaxis, likelihood of drug compliance severity of the infection simple, uncomplicated or severe, complicated malaria In the absence of reliable diagnosis, clinical assessment alone can not differentiate malaria from other common febrile illnesses. In this situation, antimalarial treatment should be given routinely for people with fever. Partners in Global Health Education 1. 2. 3. 4. 5. 6. 7. 8. 9. 10. 11. 12. 13. 14. 15. 16. 17. 18. How to use this module Learning outcomes Plasmodium species Malaria burden Question 1 Transmission Life cycle Question 2 Disease severity Question 3 Clinical malaria Question 4 Diagnosis Treatment Prevention and control Pregnancy Question 5 Information sources Treatment of uncomplicated malaria – single agents National treatment guidelines for first-line treatment are available in most malarious countries. Commonly used drugs include: • 4 -aminoquinolines - chloroquine – cheap and widely available and previously the most widely used antimalarial drug. Use is now severely limited because of widespread resistance of P. falciparum in South East Asia, East and West Africa. – blood schizonticide - kills the erythrocyte stages but has no effect on the exo-erythrocytic (liver) stages or gametocytes. – P. vivax is usually sensitive to chloroquine, although resistance is emerging. – Amodiaquine is an alternative for chloroquine-resistant falciparum malaria. 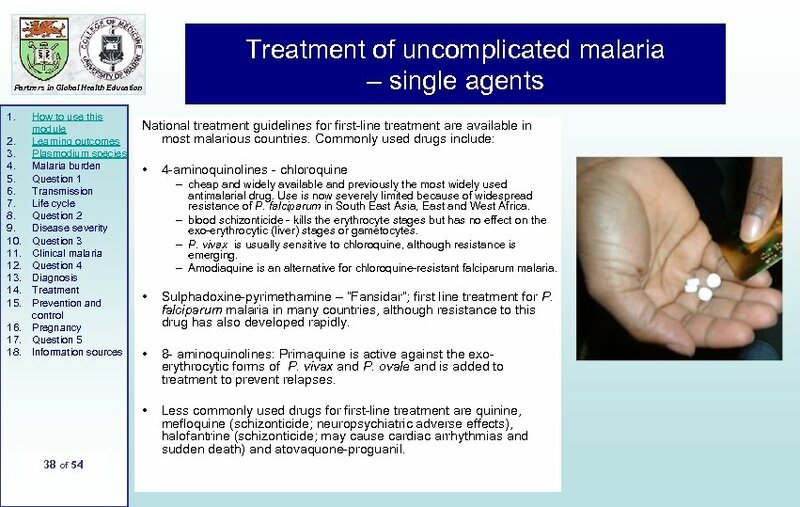 Sulphadoxine-pyrimethamine – “Fansidar”; first line treatment for P. falciparum malaria in many countries, although resistance to this drug has also developed rapidly. • 8 - aminoquinolines: Primaquine is active against the exoerythrocytic forms of P. vivax and P. ovale and is added to treatment to prevent relapses. • 38 of 54 • Less commonly used drugs for first-line treatment are quinine, mefloquine (schizonticide; neuropsychiatric adverse effects), halofantrine (schizonticide; may cause cardiac arrhythmias and sudden death) and atovaquone-proguanil. Partners in Global Health Education 1. 2. 3. 4. 5. 6. 7. 8. 9. 10. 11. 12. 13. 14. 15. 16. 17. 18. How to use this module Learning outcomes Plasmodium species Malaria burden Question 1 Transmission Life cycle Question 2 Disease severity Question 3 Clinical malaria Question 4 Diagnosis Treatment Prevention and control Pregnancy Question 5 Information sources 39 of 54 Treatment of uncomplicated malaria – drug combinations • The rapid emergence of resistance to drugs when used as single agents has led to the development of drug combinations for first-line treatment. • Combinations combine two or more schizonticidal drugs which act independantly of each other. This reduces the development of parasite resistance to the drugs used in the combination. • Artemisinin and its derivatives (artemether, artesunate, artheether; based on the Chinese herb quinhaosu) are rapidly active against erythrocytic stages and also gametocytes (therefore, may reduce transmission). Current levels of resistance are low. • Several combinations include an artemisinin derivative; e. g. dihydroartemisinin + piperaquine; artesunate + chlorproguanil/dapsone • Examples of other drug combinations are chlorproguanil + dapsone (Lapdap), atovaquone + proguanil (Malarone). • The choice of which combination to use depends on many factors, including the existing pattern of resistance and cost. • As well as drug treatment, supportive treatment for associated problems such as high fever, dehydration and anaemia are important! Partners in Global Health Education 1. 2. 3. 4. 5. 6. 7. 8. 9. 10. 11. 12. 13. 14. 15. 16. 17. 18. How to use this module Learning outcomes Plasmodium species Malaria burden Question 1 Transmission Life cycle Question 2 Disease severity Question 3 Clinical malaria Question 4 Diagnosis Treatment Prevention and control Pregnancy Question 5 Information sources 40 of 54 Treatment of severe, complicated malaria Drugs Supportive therapy Quinine is the most widely used drug. It is administered by ratecontrolled intravenous infusion. Where this is not possible, it can be administered by deep intramuscular injection. This is less desirable because of slow and uncertain absorption and risks such as injection abscess and muscle necrosis. A vital adjunct to clinical management. It includes the general care of the unconscious patient, careful fluid balance, control of seizures, nasogastric tube feeding, correction of metabolic derrangements (e. g. hypoglycaemia, metabolic acidosis) and blood transfusion for severe anaemia. 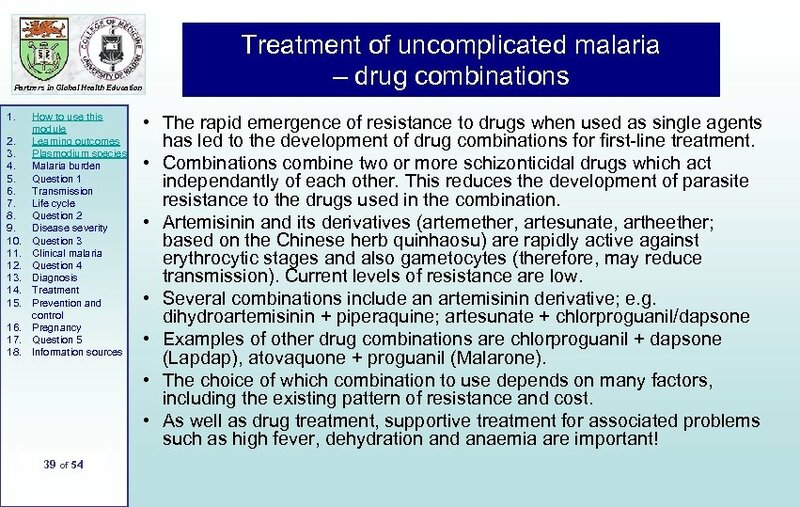 Artemisinin derivatives are also used to treat severe malaria. 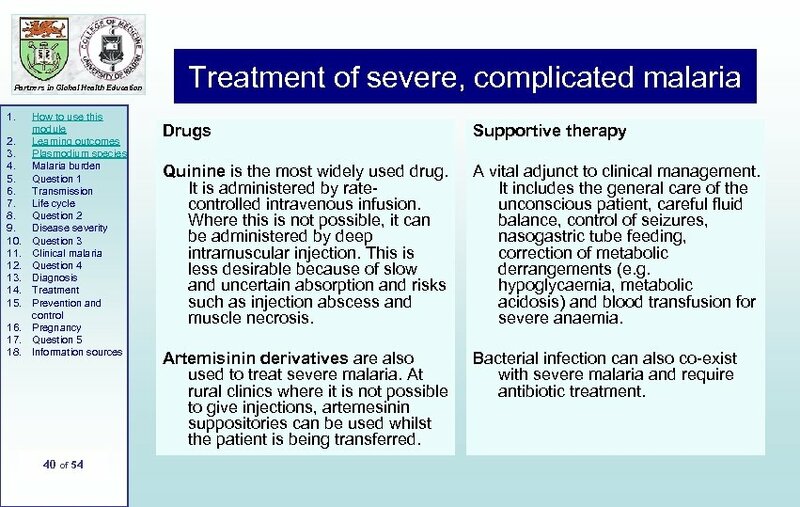 At rural clinics where it is not possible to give injections, artemesinin suppositories can be used whilst the patient is being transferred. Bacterial infection can also co-exist with severe malaria and require antibiotic treatment. Malaria prevention and control Partners in Global Health Education 1. 2. 3. 4. 5. 6. 7. 8. 9. 10. 11. 12. 13. 14. 15. 16. 17. 18. How to use this module Learning outcomes Plasmodium species Malaria burden Question 1 Transmission Life cycle Question 2 Disease severity Question 3 Clinical malaria Question 4 Diagnosis Treatment Prevention and control Pregnancy Question 5 Information sources 41 of 54 Reducing man-mosquito contact Insecticide-treated nets (ITNs) are relatively cheap and, if used correctly, an effective means of preventing malaria. The development of longlasting nets may help to overcome the requirement to retreat nets with insecticide regularly. The major difficulty remains achieving high coverage rates of ITNs in the most atrisk populations. Historically, indoor house-spraying with residual insecticides (e. g. DDT) achieved many successes but was not sustainable. 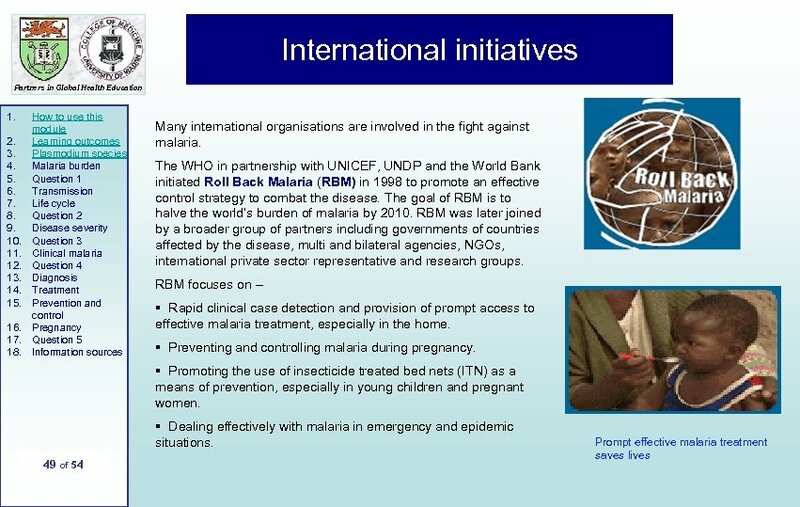 However, some countries still use this approach as part of their public health measures against malaria. Other means to reduce contact for individuals are wearing of protective clothing and insect repellents at dawn and dusk. Families are advised to prioritise the use of bed nets for children under 5 years and pregnant women – the family members at most risk of developing severe malaria. Malaria prevention and control Partners in Global Health Education 1. 2. 3. 4. 5. 6. 7. 8. 9. 10. 11. 12. 13. 14. 15. 16. 17. 18. How to use this module Learning outcomes Plasmodium species Malaria burden Question 1 Transmission Life cycle Question 2 Disease severity Question 3 Clinical malaria Question 4 Diagnosis Treatment Prevention and control Pregnancy Question 5 Information sources 42 of 54 Chemoprophylaxis is the administration of drugs to individuals likely to be exposed to malaria. 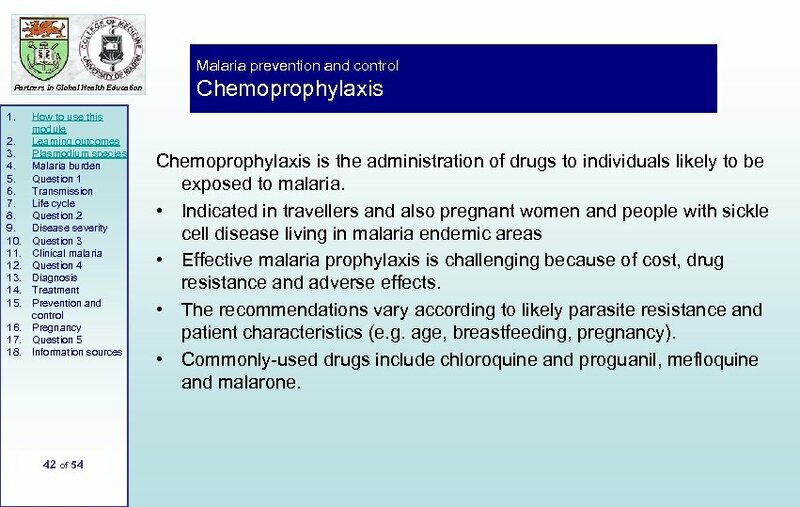 • Indicated in travellers and also pregnant women and people with sickle cell disease living in malaria endemic areas • Effective malaria prophylaxis is challenging because of cost, drug resistance and adverse effects. • The recommendations vary according to likely parasite resistance and patient characteristics (e. g. age, breastfeeding, pregnancy). • Commonly-used drugs include chloroquine and proguanil, mefloquine and malarone. 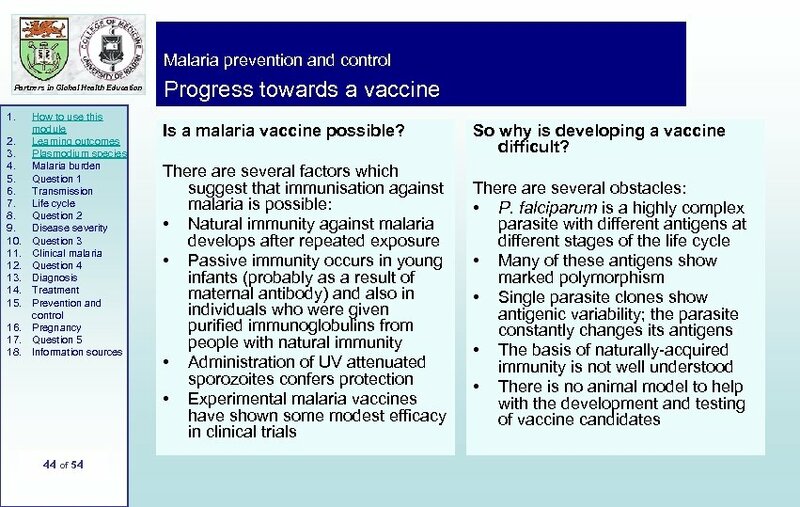 Malaria prevention and control What vaccines are under development? Partners in Global Health Education 1. 2. 3. 4. 5. 6. 7. 8. 9. 10. 11. 12. 13. 14. 15. 16. 17. 18. How to use this module Learning outcomes Plasmodium species Malaria burden Question 1 Transmission Life cycle Question 2 Disease severity Question 3 Clinical malaria Question 4 Diagnosis Treatment Prevention and control Pregnancy Question 5 Information sources 45 of 54 There around 75 candidate vaccines under development. 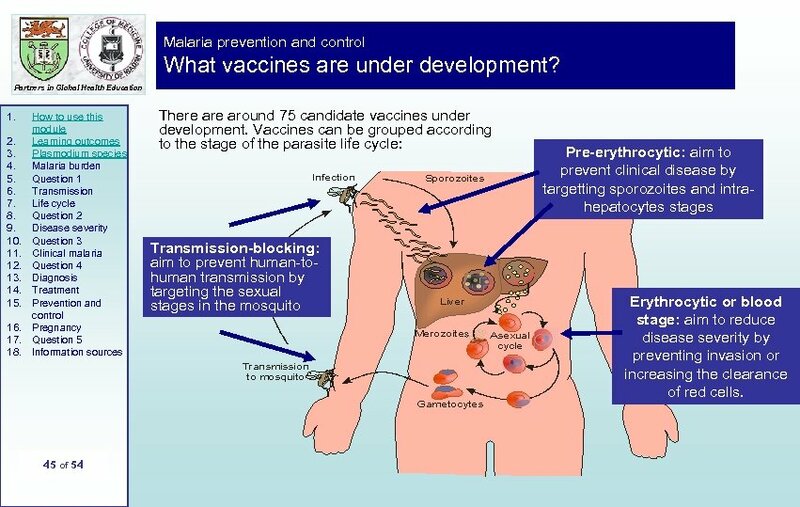 Vaccines can be grouped according to the stage of the parasite life cycle: Transmission-blocking: aim to prevent human-tohuman transmission by targeting the sexual stages in the mosquito Pre-erythrocytic: aim to prevent clinical disease by targetting sporozoites and intrahepatocytes stages Erythrocytic or blood stage: aim to reduce disease severity by preventing invasion or increasing the clearance of red cells. Malaria prevention and control Partners in Global Health Education 1. 2. 3. 4. 5. 6. 7. 8. 9. 10. 11. 12. 13. 14. 15. 16. 17. 18. How to use this module Learning outcomes Plasmodium species Malaria burden Question 1 Transmission Life cycle Question 2 Disease severity Question 3 Clinical malaria Question 4 Diagnosis Treatment Prevention and control Pregnancy Question 5 Information sources 46 of 54 What are the leading vaccine candidates? There are hundreds of parasite proteins which could form targets for vaccines. Various strategies of stimulating the host’s immune response are being evaluated including prime-boost, virosomes and synthetic parasite peptides. 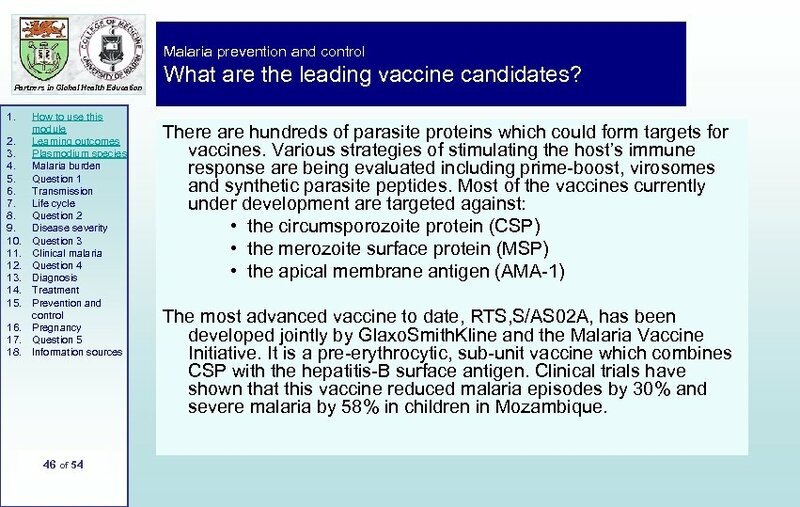 Most of the vaccines currently under development are targeted against: • the circumsporozoite protein (CSP) • the merozoite surface protein (MSP) • the apical membrane antigen (AMA-1) The most advanced vaccine to date, RTS, S/AS 02 A, has been developed jointly by Glaxo. Smith. 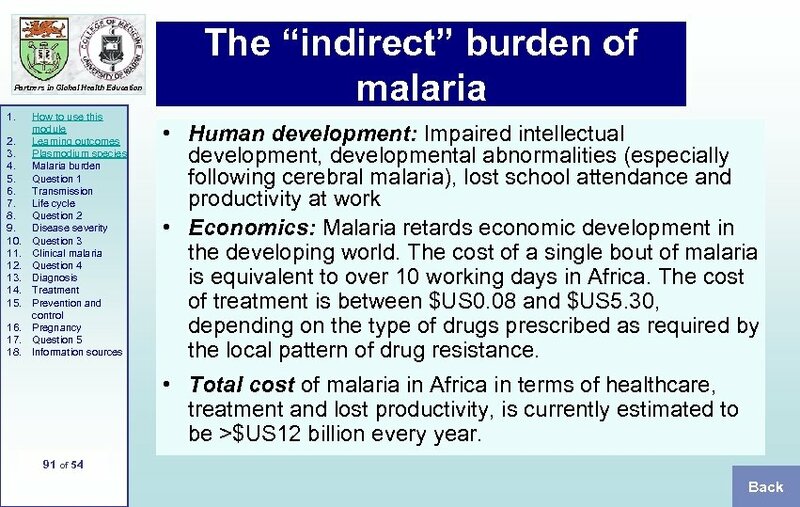 Kline and the Malaria Vaccine Initiative. It is a pre-erythrocytic, sub-unit vaccine which combines CSP with the hepatitis-B surface antigen. Clinical trials have shown that this vaccine reduced malaria episodes by 30% and severe malaria by 58% in children in Mozambique. End of Section 4 Partners in Global Health Education 1. 2. 3. 4. 5. 6. 7. 8. 9. 10. 11. 12. 13. 14. 15. 16. 17. 18. 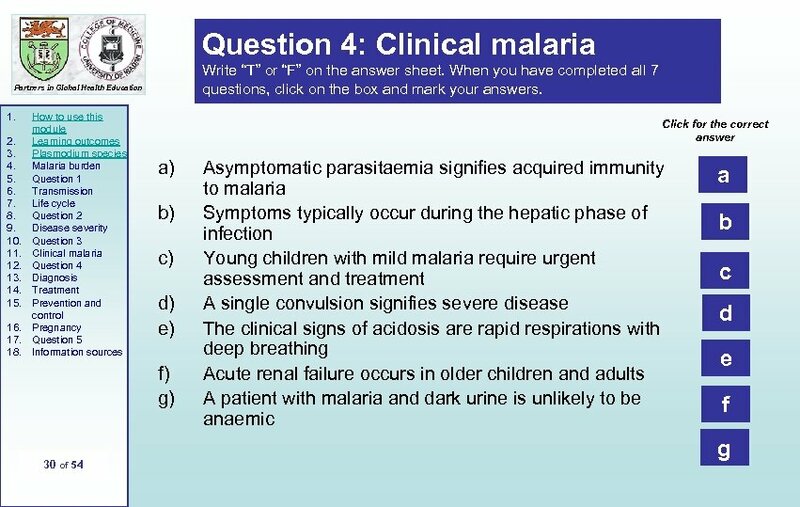 How to use this module Learning outcomes Plasmodium species Malaria burden Question 1 Transmission Life cycle Question 2 Disease severity Question 3 Clinical malaria Question 4 Diagnosis Treatment Prevention and control Pregnancy Question 5 Information sources 50 of 54 You have come a long way! This is the last of the sections. 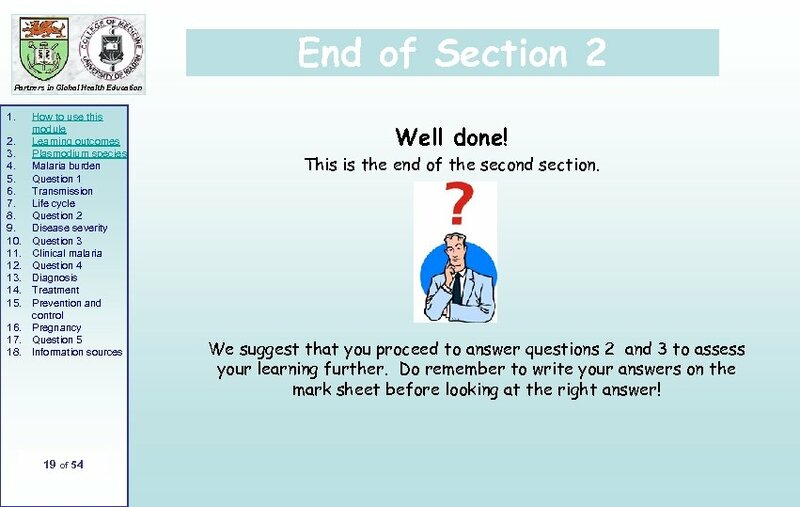 For the section just ended, you should be able to answer Question 5 to assess what you have learnt. It is still required that you put down your answers on the mark sheet before looking at the right answer! Sources of information Partners in Global Health Education 1. 2. 3. 4. 5. 6. 7. 8. 9. 10. 11. 12. 13. 14. 15. 16. 17. 18. 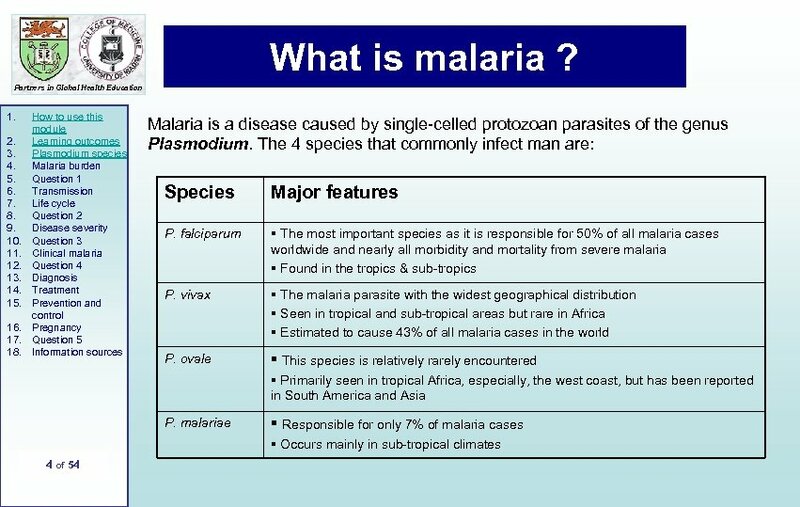 How to use this module Learning outcomes Plasmodium species Malaria burden Question 1 Transmission Life cycle Question 2 Disease severity Question 3 Clinical malaria Question 4 Diagnosis Treatment Prevention and control Pregnancy Question 5 Information sources • • 52 of 54 Malaria. Greenwood BM, Bojang K, Whitty CJ, Targett GA. Review; Lancet 2005; 365: 1487 -98. http: //mosquito. who. int/cmc_upload/0/000/015/372/RBMInfosheet_1. 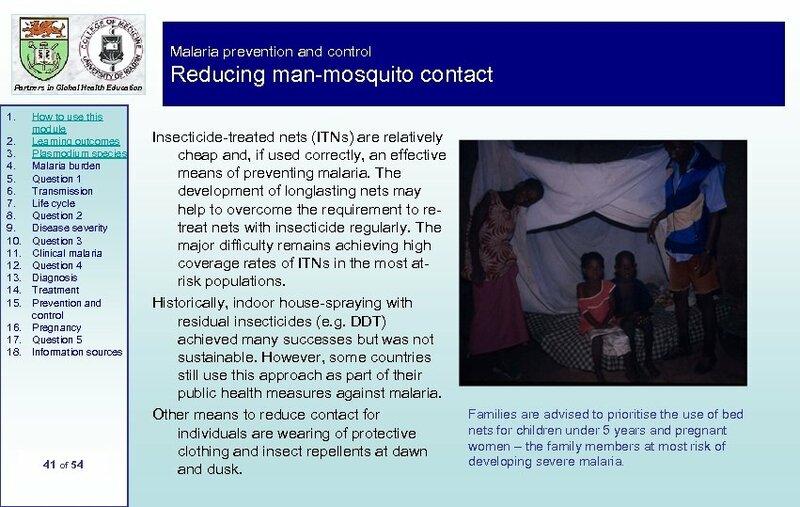 htm These WHO fact sheets developed by the Roll Back Malaria Partnership cover many different aspects of malaria – including prevention with insecticide-treated bed nets and treatment with atemesinin-based combination therapies http: //www. cdc. 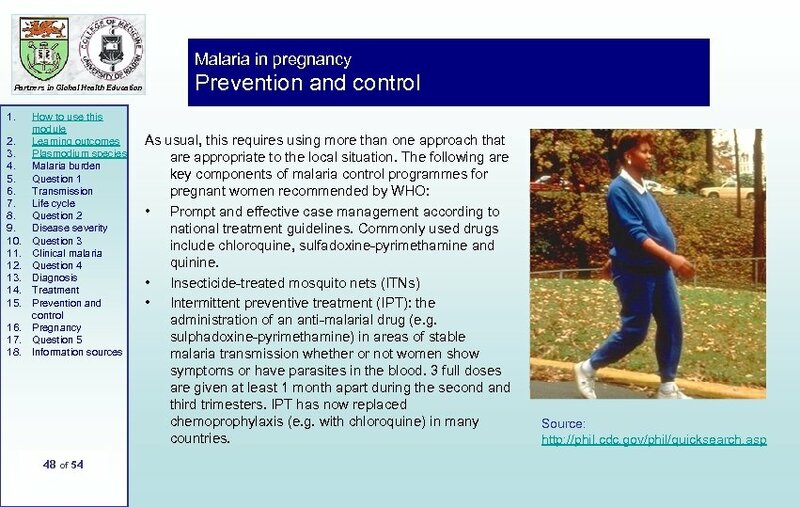 gov/malaria/ The US Centre for Disease Control and Prevention site for malaria http: //www. malaria. org/ Follow the “Learn about malaria” link on the Malaria Foundation’s website. This contains numerous useful and accessible resources. http: //www. rph. wa. gov. au/labs/haem/malaria/ An interactive resource from the Royal Perth Hospital, Western Australia. 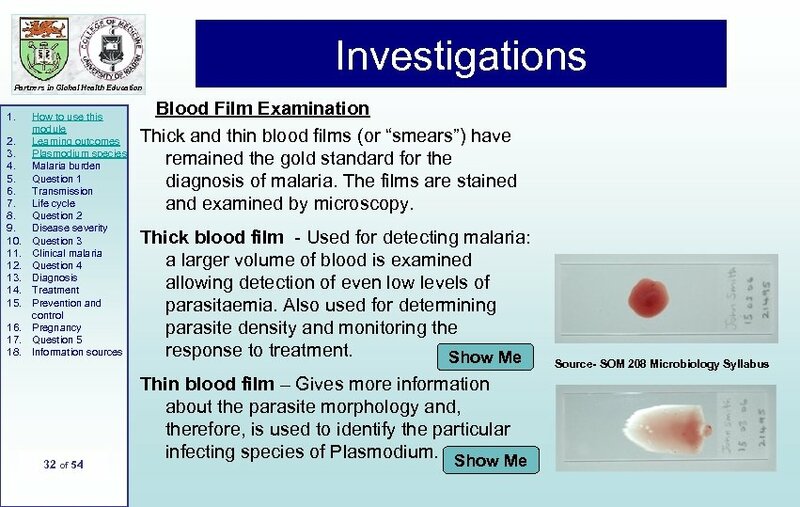 Contains useful self-assessment exercises in malaria diagnosis by microscopy that are set in the context of clinical cases. 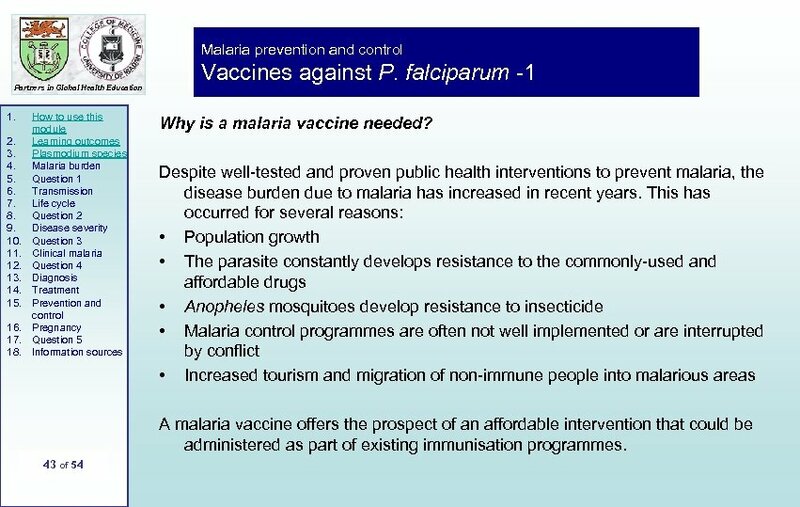 Towards an effective malaria vaccine. Aide P, Bassat Q, Alonso P. Arch Dis Child 2007; 92: 476 -9. Malaria. A handbook for Health Professionals. Malaria Consortium. Macmillan Publishers Limited; 2007. End of Module Partners in Global Health Education 1. 2. 3. 4. 5. 6. 7. 8. 9. 10. 11. 12. 13. 14. 15. 16. 17. 18. 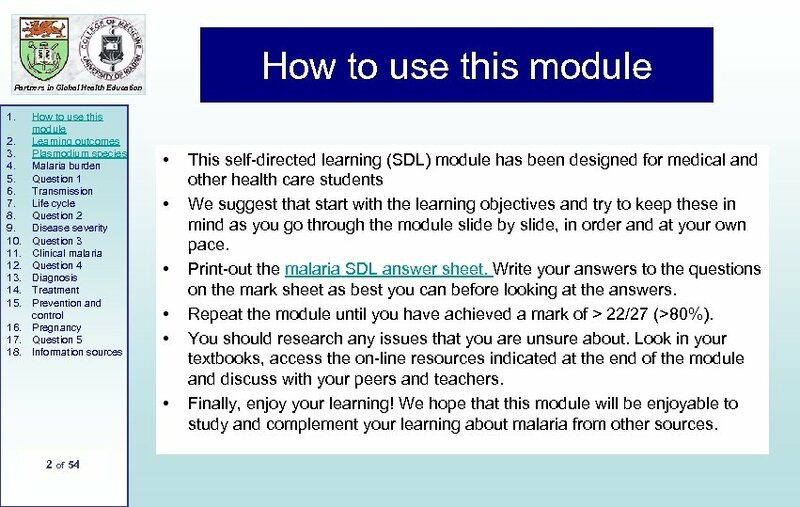 How to use this module Learning outcomes Plasmodium species Malaria burden Question 1 Transmission Life cycle Question 2 Disease severity Question 3 Clinical malaria Question 4 Diagnosis Treatment Prevention and control Pregnancy Question 5 Information sources Well done! 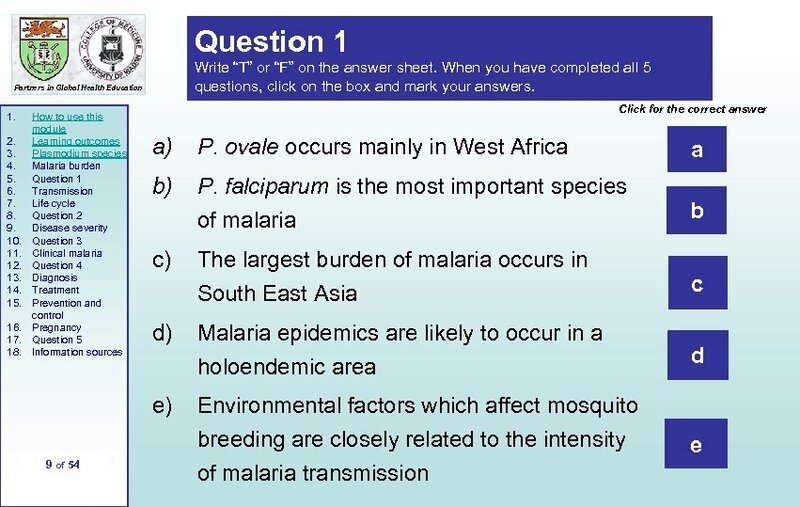 Now that you have completed the malaria module and attempted sectional questions, you may wish to take on the full quiz to assess your learning for the whole module. Please print out the questions The questions may differ slightly from those you have come across in the sectional assessment but are based on the material covered in this module. END OF MODULE QUIZ You will also find a link to the answers at the end of the quiz to measure your performance 53 of 54 Please attempt this as many times as you wish.